Once a fishing and logging town on the Pacific Rim of Vancouver Island, Tofino is swiftly becoming a popular holiday destination for travellers around the globe. Tucked away at the entrance of the Clayoquot Sound, the area is home to the Pacific Rim National Park, gorgeous beaches, islands with ancient forests, hot springs, and Long Beach, the premier surfing spot in Canada. Tofino is home to only about 2,000 locals, who enjoy exclusive access to its mild climate and resplendent natural beauty. The area boasts plenty of activities for visitors, including kayaking, whale watching, surfing, and fishing. Accessible by air or sea, Hot Springs Cove is open year round and visitors can soak in rock pools filled with boiling spring water cooled by ocean surf. Other popular sights include the 800-year-old Eik Cedar; the Tofino Botanical Gardens with acres of forest, shoreline, and gardens; and the Whale Centre Maritime Museum housing fascinating artefacts. The Wickannish Interpretive Centre, containing interesting information about the region and the Nuu-chah-nulth First Nations (the area's original inhabitants), is well worth a visit. Tofino offers visitors the perfect combination of a range of activities, as well as a chance to relax and put their feet up surrounded by unparalleled beauty. There are plenty of shops for holidaymakers in Tofino, with many specialising in First Nations art and crafts. Holidaymakers can find a number of restaurant styles in Tofino, ranging from pizza, sushi, regional produce, organic foods, to fresh seafood, deli-style offerings, classic Italian, and Nuu-Chah-Nulth First Nations cuisine. There are also a number of catering services available. Tofino is not celebrated for its nightlife, with only a handful of bars and pubs and not much of a nightclub scene. There are a number of activities in Tofino and its surrounds, with plenty to enthral and entertain holidaymakers all year round. Kayaking here is excellent: numerous bays and inlets provide a great way to explore the area in a sheltered manner, while the more adventurous can head out into the open ocean or opt to kayak with Orcas. Whale watching is also a popular activity as pods of migratory grey whales frequent the area in mid-spring, with guided tours on offer by various charter companies. Tofino and neighbouring Ucluelet celebrate this event with the entertaining and interesting Pacific Rim Whale Festival from mid-March to mid-April. 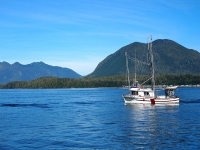 Other activities in Tofino include world-class fishing, scuba diving, windsurfing, hiking through the rainforest, golfing, beach combing, eco tours, cultural tours, and even winter storm watching, with winds whipping up the ocean and creating huge waves that crash spectacularly on the shore. Of course, surfing is immensely popular in Tofino, with Long Beach offering arguably the best surf in the country, particularly in winter, and a unique surf camp is available, as well as an all-women surf school. The lack of an energetic nightlife may disappoint some visitors.